Our product range includes a wide range of dual temperature beverage refrigerator, dual temperature pharmaceutical refrigerator, dual temperature control refrigerator and dual temperature refrigerator. 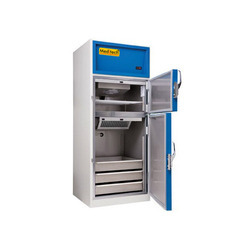 Used for the purpose of storing several vaccines and medicines that require temperature control, this Dual Temperature Beverage Refrigerator is regarded for the high level of efficiency. Manufactured using high quality raw materials and passed through a number of quality examinations, this product is widely known in the market for its quality. Offered by us in the market at a very reasonable price, this product is highly demanded. Dual temperature display of Refrigerator and Freezer temp. Known for high capacity and efficiency, this Dual Temperature Pharmaceutical Refrigerator is highly appreciated in the market. The manufacturing of this product involves use of high quality raw materials and advanced technology. The process takes place under the supervision of experienced professionals. Further, this product is processed through a number of quality checks to eliminate the products with manufacturing defects. This product is used for the purpose of storing several medical products that require temperature control. Temperature range Freezer = -10°C to -20 °C micro controller based temperature controller includes digital Dual temperature display of Refrigerator and Freezer temp. Known for its efficiency and eco friendly nature, this Dual Temperature Control Refrigerator is highly demanded in the market. The manufacturing of this product involves the use of high quality raw materials and advanced technology. This product has a very strong and durable body. This product is used in several pharmacies, hospitals, clinics, etc. 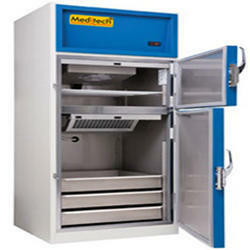 for the purpose of storing products that require specific temperature conditions for sustainability. In order to maintain the quality standards, we send this product for a number of quality examinations. Looking for “Dual Temperature Refrigerator”?